Granduc's ore was crushed once at the mine, stored, and then loaded into these 50-ton side-dump ore cars to be hauled in 15 or 20-car trains to the concentrator at Tide Lake.From the crusher, ore traveled by conveyor belt to two bins, from either of which it was loaded into 50-ton railroad cars for the ten- mile trip to Tide Lake. Speed and volume with safety, were essential elements here therefore the ore trains include 15 to 20 cars and the electric locomotives are capable of pulling the trains at 40 miles per hour. A round trip would take slightly more than one hour The same locomotives haul mining crews to and from the mine in specially-designed passenger cars. On reaching the concentrator end of the tunnel at Tide Lake, the ore trains dump their loads into a storage bin. 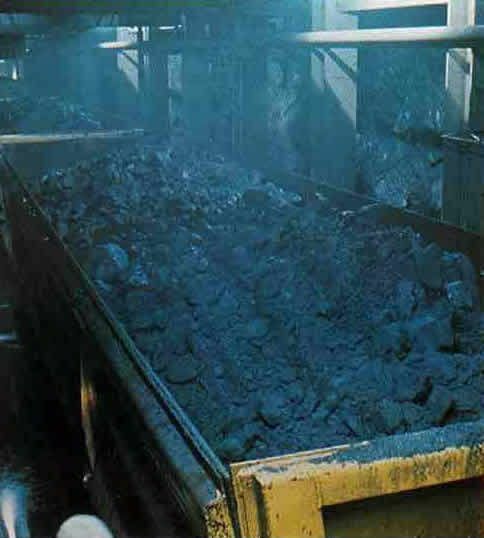 Conveyors then raise the ore to the fine crushing plant where it was crushed and then conveyed to fine ore storage bins located ahead of the grinding circuit. The high cost of steel grinding media at Granduc made some form of autogenous grinding attractive. Ore pebbles were screened out of the feed to the fine crushing plant and replace most of the steel balls that would otherwise be used as grinding media in the grinding circuit. There were two grinding lines, each consisting of one rod mill and two pebble mills. The pebble addition and the grinding circuits were completely instrument-controlled and operate with a minimum of supervision. The ore, after grinding, follows the conventional practice of flotation, thickening, filtration and drying. The dried concentrate was then hauled by trucks over the 32-mile road to the marine terminal in Stewart. A special design, using cylindrical tanks, enables these trucks to carry fuel oil on the return trip to the mine. Snow crews work continuously during the winter to keep this road open because the six concentrate trucks made a total of 24 round trips each day to keep ahead of mine production, and men traveled in and out every day. The marine terminal in Stewart was located at the head of a fjord, the Portland Canal, 120 miles from the open Pacific Ocean. The terminal could handle ships as large as 50,000 tons displacement. The first shipload of Granduc concentrate left Stewart for Japan in January, 1971.